For the rugby player, see Jan de Klerk (rugby union). Johannes "Jan" de Klerk, DMS (22 July 1903 – 24 January 1979) was a South African politician. He was the father of F. W. de Klerk, the last State President of South Africa. As a member of the National Party, de Klerk served as interim State President for nine days following the retirement of Jacobus Johannes Fouché in 1975. 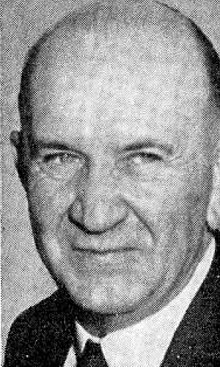 Prior to this, he served as a Senator (1955–1975), Minister of Work and Public Works (1954–1958), Work and Mines (1958–1961), Home Affairs, Work and Immigration (1961), Home Affairs, Education and Arts and Sciences (1961–1966), Education, Arts and Sciences and Information (1966–1967) and National Education (1968–1969), and President of the Senate from 1969 to 1976. The eldest son of Reverend Willem de Klerk, a Dutch Reformed Church minister and his wife Aletta Johanna van Rooy, Jan de Klerk was born 22 July 1903 in Burgersdorp. He spent his childhood in Potchefstroom, in South-West Transvaal. He studied Christian Higher Education at the Potchefstroom University, where he obtained a BA degree and a higher education diploma in 1926 after three years. he was the President of the Student Union, he married Hendrina Cornelia Coetzer on 27 April 1927, and had two sons, Willem Johannes (Wimpie) and Frederik Willem (F.W.). From 1927 to 1945, Jan de Klerk worked in Nylstroom and Witwatersrand. He was headteacher of a school, and secretary of a white workers' trade union. In January 1947, he became administrative secretary of the National Party for the Rand region and in 1948, chief secretary of the NP of Transvaal. From 1949 to 1955, he was a member of the provincial council of Transvaal. In 1954, Jan de Klerk was named senator and Minister of Work and Public Works in the government of his brother-in-law, Prime Minister JG Strijdom. This nomination provoked controversy due to the relationship between the two men. He was a minister in the governments of Hendrik Verwoerd and John Vorster. Until 1969, he successively dealt with mines, home affairs, immigration, and education. While Minister of Education, he helped found the Rand Afrikaans University (RAU) in Johannesburg and the University of Port Elizabeth (UPE), while also chancellor of the University of Potchefstroom (PU vir CHO). He was twice approached to be honorary president of the republic in 1967 and 1968. By the time of his retirement from the cabinet, de Klerk had been a cabinet minister for more than fifteen years and was rewarded with the Decoration for Meritorious Service. From 1969 to 1976, he presided over the Senate or upper house of the South African parliament, and this meant that he was briefly interim President of South Africa in 1975. He retired from political life, spent his last few years on a farm and died in Krugersdorp on 24 January 1979. A school in Krugersdorp is named in honour of Jan de Klerk. ^ a b "Johannes de Klerk". Archontology.com. This page was last edited on 15 October 2018, at 08:00 (UTC).